The Andersen Chronicle: How Long Has That Been There? How Long Has That Been There? About a week ago we were conversing with our friend, Lauren, regarding the teething stage. 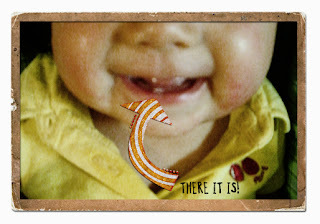 Her six-month-old girl was getting her first tooth. When asked about Ramona, I replied that she hadn't begun teething. Later, as Ramona was crying, Lauren spotted Mona's tooth! Please excuse the poor photography, some of you may know how difficult it is to capture a baby's tooth. I slightly enhanced the tooth for you. :) The happy, proud owner, our little Mona. She's 5.5 months old now! Thanks for sharing this special moment with us! Tee hee hee! hey Jen! I found your blog through Trisha's "old" blog. Your girls are so cute! Last time I saw you, Eliza was just a baby! It looks like you guys are doing so good! Of course you can link me. Your digital scrapbooking is amazing. LOVE IT!!! That is a hobby I want someday..... Oh, and I am due the 27th of Nevember. Mona looks so cute! 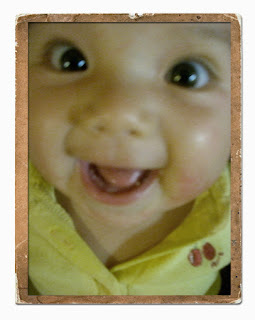 I'm still waiting for Audrey's first tooth. I think it's coming soon.